Numbers published today by the Dental Schools Council indicate a concerning decline in the number of clinical academics on the Research & Scholarship pathway. 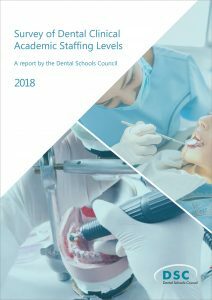 Numbers are now at an all-time low of 344 Full-Time Equivalents (FTE) across the UK’s 18 publicly funded dental schools. Concerns are raised about difficulties in recruitment to these posts and the lack of research experience for trainees coming through the clinical academic pathway. This is in a context of four new dental schools and expanding student numbers. Many schools have responded creatively to this through an increase in the number of appointments to Teaching & Scholarship roles. In 2015, these roles number 239 FTE, some 60% higher than five years ago and now making up 41% of all clinical academics. The majority of funding for dental clinical academic posts is from the four Higher Education Funding Councils (74%). Nearly one third of clinical academic dentists are specialists in restorative dentistry (28%). Half of the clinical academic workforce is aged under 46. Women make up 41% of the clinical academic workforce. There are more women Lecturers than men (57%) for the first time, although women remain under represented at Professorial grade (20%). ‘A key role of dental schools is to provide education which is grounded in research. This academic basis is just as essential for the majority of graduates who will go into general dental practice as it is for those who will go into academia. We are now risking the balance necessary to produce graduates with the skills needed for a profession which is always changing. As well as this, the loss of research-active expertise at the early career stage will in time mean a lack of such expertise at the later stages, including in leadership positions. ‘It is essential for the profession that we avoid this potential imbalance. What’s required is increased incentives to the Research & Scholarship pathway of clinical academia undertaking oral and dental research. Dental schools should be at the forefront of this while encouraging a broader cross-sector effort to inspire young dentists to careers in academic research. This is the 14th data update to be published by the Dental Schools Council since 2000. 18 dental schools returned data on clinical academic grade, specialty, percentage full-time, source of funding, age, gender and ethnicity for each individual in post as at 31 July 2015. For further information about the work of the Dental Schools Council please see www.dentalschoolscouncil.ac.uk.